As you may know, I love watching football - and I support my team with the ferocity of a mother lioness defending her cubs from a double-pronged attack by blood-sucking martian aliens and wildlife photographers. But I find the world of football management very intriguing indeed. In the world of football, good managers are hot property. In a highly competitive, results-driven industry, managers don't often get much time to prove themselves - they either deliver results straight away, or they're out of a job. Of course, the high levels of expectation on top football managers come with big rewards - but the punishment for failures (or, perceived failures) can be even greater. The growing trend of impatience - despite the evidence that knee-jerk sackings generally don't improve football clubs' fortunes - with under performing managers, on the part of both club owners and ordinary fans, is a concern. But to what extent are a manager's true talents masked by the players he has available to him? In the wake of José Mourinho's return to Chelsea this season, and Chelsea's subsequent success in both the Premier League (of which they are currently top) and the Champions' League (in which they are through to the Quarter-Finals), people are quick to point to Mourinho's management as reason for this. There is no doubt that he is a fine manager, who is indeed very good at his job - but Chelsea weren't exactly a bad team before Mourinho returned to Stamford Bridge either! Pep Guardiola spent four years managing Barcelona, during which time he won fourteen major trophies - a truly remarkable record. After a year's sabbatical, he then took over at reigning German Champions Bayern Munich, and has retained their Bundesliga title in his first season with them. He is still on course to make this Bayern's second treble-winning season in a row. No one can argue with the facts. When you look at the careers of managers like Mourinho and Guardiola - the clubs they have managed, and the competitions they have won - it is impossible to escape the conclusion that they are some of the top men in their field. But there is an argument to say that, when you get to choose who you work with, and you go from elite club to elite club, walking into a dressing room already packed with world-class players and backed by an ambitious club owner with a vision and a bank balance to match it, you'll always have at least some success. I don't want to say "anyone could do it" (that is an especially crass argument when it works the other way, and is just as much so in this context) - but when you walk into a job managing a confident, dominant team who are the current Champions of Europe (as Guardiola did at Bayern Munich), how much worse can you do? I don't especially have a point to make here - I'm just musing. But I do think this is a very interesting topic. And I do think it would be enthralling to see just how much difference a Guardiola or a Mourinho could make at a lower-mid-table Premier League team; a West Brom, or a Crystal Palace, or (please, God!) a Norwich City. Would those teams' results improve? Undoubtedly. Would the same squad suddenly by vying for a Champions' League place? I'm not so sure. Similarly, if (for example) Tony Pulis or Sam Allardyce were to take over at Bayern Munich, or Real Madrid, or Paris St. Germain next season, what effect would that have? The star players at those most illustrious of European football clubs would still be highly-gifted, world-class footballers. Would those teams lose some of their flare and dominance? Quite possibly. Would they suddenly be fighting relegation battles and being knocked out in the early stages of domestic cup competitions? Probably not. Frankly, although that would be a brilliant experiment to watch, it's never going to happen - for obvious reasons! What we can say for certain, though, is that quality attracts quality. That the best managers and the best players so often end up working together at the best and most famous clubs in Europe may seem serendipitous for them, but that doesn't happen by accident. I was recently introduced to the phenomenon of GoggleBox - a television programme on Channel 4. Billed as a window into the world of 'Britain's most opinionated viewers', GoggleBox features a variety of 'ordinary people' watching television and talking about it. It was not long into my first viewing of GoggleBox before I realised that instead of watching television, I was watching other people watch television. I was consuming second-hand television - instead of choosing to watch something myself, and form my own opinions about it, I had chosen to watch other people do that. Quite apart from the fact that we are more obsessed that we have ever been about what 'ordinary people' think about anything (that is a topic for another day! ), this must be a very easy programme for Channel 4 to make. It doesn't need a set, or costumes, or scripts, or stuntmen - it doesn't even need any original or creative thinking to make it. And this, I think, is the main issue I have with GoggleBox; there's nothing new in it - it is regurgitated media. More and more media these days falls into this category. On the internet, you'd probably expect that - the average Tumblr Blog probably has more content 'reblogged' from other users than original posts written by the Blog's owner (just one of the reasons why I don't like Tumblr). But sites like BuzzFeed have taken collating and redistributing other people's material to a whole new level - and now even serious, reputable newspapers post 'articles' which are just a collection of Tweets or posts from other sources, apparently thinking that this constitutes journalism. On television, though, that feels a little like cheating. GoggleBox is on at nine o'clock on a Friday night - that's seriously mainstream primetime television - but it doesn't require the creation of any original material at all. It is simply relaying people's reactions to other original programmes which have already been broadcast. Channel 4 are passing this off as a television programme in its own right, but I think they're having a laugh. The 'No Make-Up Selfie' is one of the biggest stories on social media this week. The way it's supposed to work is: you post a picture of yourself wearing no make-up on Facebook, then you nominate a couple of friends who also have to post pictures of themselves wearing no make-up, and somewhere along the line somebody texts the word BEAT to 70099 to donate £3 to Cancer Research UK. But, this being Facebook, even the humble act of charitable giving has developed into an argumentative brawl. There has been a backlash against the 'No Make-Up Selfie' campaign, with people claiming that simply posting a picture of yourself on the internet doesn't actually do anything to raise money for Cancer Research (which is true). But other people have pointed out that Cancer Research UK have seen a £2m increase in donations since the campaign began, so if the posts are encouraging more people to give to the cause, what's the big deal? If you take it in isolation, the 'No Make-Up Selfie' campaign is undoubtedly a force for good; the increase in the amount raised by Cancer Research UK bears that out. But in context, it is part of a growing trend of 'Facebook Activism', which I worry might be harming, rather than helping, charitable causes in the long run. I'm sure the 'No Make-Up Selfie' is not the first charity-related Facebook campaign you have seen. I remember a time when everyone was supposed to change their profile picture to a cartoon character from a TV programme they used to watch in their youth, to 'raise awareness' for child abuse - to name just once. Of course, there's nothing inherently wrong with this. 'Raising awareness' about important issues on social media is great, as far as it goes. But that's just the point - it doesn't go nearly far enough. The trouble with 'Facebook Activism' is that it gives you the illusion of doing good without actually making any real difference. People can feel complacent, believing that they have 'done their bit' merely by posting a status update, or changing their profile picture. Coming back to the excellent work done by Cancer Research UK, for a moment... I myself have had a direct debit set up to make a regular donation to Cancer Research UK since long before the 'No Make-Up Selfie' craze took off, and I have taken part in several fundraising events to raise money for cancer charities. I'm not saying this to hold myself up as some paragon of charitable piety (it's more to fill space in this post - y'know, add another paragraph), but I think it's interesting to put yourself in the position of someone working at one of these charities. I'm sure you'd be delighted to know that some social media craze meant everyone was talking about the charitable work you did, and that your cause was at the forefront of the national consciousness - but you'd probably be even happier to think people were actually going out and doing something to help, instead of tapping away on a smartphone and thinking that, in itself, constituted 'doing enough'. 'Raising awareness' on Facebook is a brilliant way to augment the tireless work of charity activists - but it doesn't, and can't, replace it. 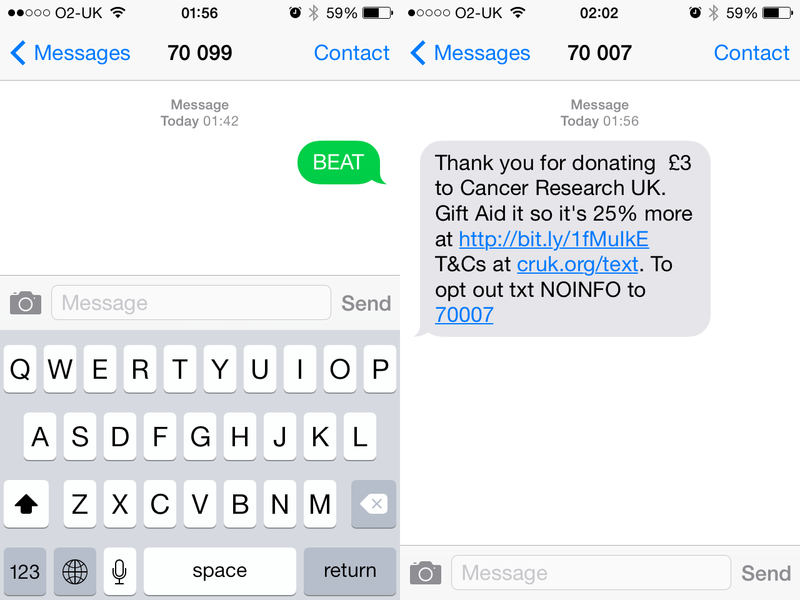 Text BEAT to 70099 now. But will we? Well, these are worrying times for Canaries fans. As I write this, we are currently losing 1-0 to Southampton. For a variety of (non-footballing) reasons, this is the match this season which I have most wanted us to win - there's still time to take something from the game, of course, but at the moment it all seems very disappointing. This whole season, Norwich have been haunted by the spectre of the run-in. The 'run-in' has hung over Carrow Road like the sword of damocles; I think there is something in Alan Hansen's and Alan Shearer's contracts which says they can't make a comment about Norwich without mentioning it. For those who are not familiar with the concept of the run-in, it is all to do the fact that the final four games of our season are against four 'big' teams, and that it will be difficult to pick up the points required in these games, if survival has not been ensured before that point. 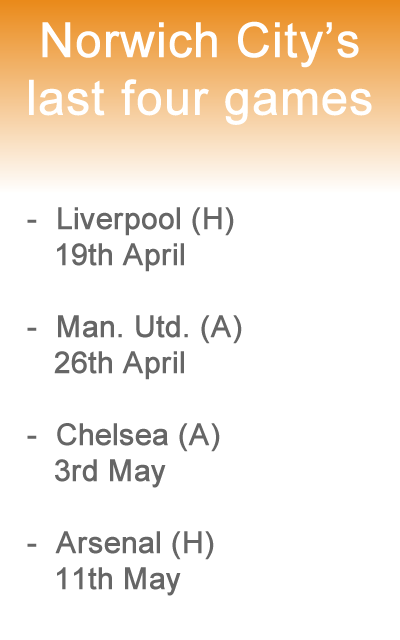 I appreciate that this is a pretty tough run of games with which to end the season - but if you put things into perspective, and realise that all the teams in the Premier League have to play all the other teams twice over a season, and that the number of points available from these matches is the same irrespective of when in the season they occur, the significance of the run-in does diminish somewhat. When you consider that, last year, everyone had discounted Norwich's trip to play Man. City at the Etihad on the final day of the season in their survival calculations (thinking there was no way we could win that match, and that we would need to have secured Premier League status ahead of that day) - and, in the end, we went there and beat Man. City 3-2, the significance of the run-in decreases yet further. However, even more baffling is the way people talk about the games before these final four! It is universally acknowledged that at least three of these four teams are playing some of the best football in the country, and have formidably impressive records this season. The same cannot be said of Sunderland, Swansea, West Brom and Fulham. But people are just as keen to discount Norwich's chances in those games as they are against the 'big' teams. The logic here seems to be that games against top teams are very tricky because they are good teams with some of the most highly talented footballers in the world playing for them - whilst games against teams in the bottom half of the table are very tricky because they are desperately scrapping for their survival in a highly competitive environment. This is, of course, true - and leads us to inescapable conclusion that every game in the Premier League is a hard game. So why obsess over it? Why do we continually point at the next game, or the next three games, or the last however-many games, and solemnly intone that 'these are hard fixtures' - when we know that the same could be said of any given run of games in any season. There are no easy matches in the Premier League - everyone knows that - and those fixtures against the really world-class teams who completely destroy you all over the field are inevitable, whenever they occur in the season. So, let's stop barking up this entirely unsatisfying tree. I think we're all aware that there have been issues with Norwich's performances this season. All too often, we have played well, but not got the result we deserved; or we have played poorly and got the result we deserve; or we have started well, gone ahead by one goal, and then let the lead slip and ended up losing. We are not creative enough on the pitch, and our strikers have not been scoring at the rate we need. The extent to which these issues are down to bad management is still open for debate, and not something I'm going to discuss here. But I still believe that we are not one of the three worst teams in the division. We are in a precarious position, and it would be wrong to kid ourselves otherwise - but I think we have a decent chance of staying up. To do that, we need to pick up points; how we get them, or against whom, is entirely irrelevant - but poring over our fixture list with tears in our eyes, writing 'tough game' against each date in thick red marker pen won't help at all. We know these games are going to be difficult - we've accepted that fact - now let's not fixate on that fact, let's focus on the football. "I Tried To Push Him Away With My Head"
The big story from the day's Premier League action today was that Newcastle United manager Alan Pardew had headbutted Hull City midfielder David Meyler during a disagreement on the touchline, and had therefore been sent to the stands by the referee. 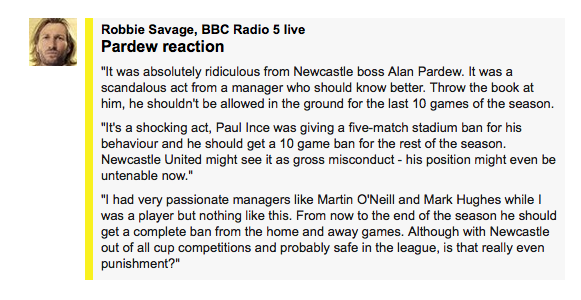 BBC Sport pundit Robbie Savage has been wrong before. These comments make very little sense, though. Why should Newcastle's position in the League table, or the fact they've been knocked out of both domestic cup competitions, have any bearing on this matter? I know the FA are renowned for the inconsistency of their punishments in such situations as these, but if they base their decision about how to deal with Pardew in this instance on Newcastle's form this season they will make a mockery of the entire thing. Various people have been calling for Pardew to be sacked by Newcastle United. I think that's ridiculous. Why should the club sack him because of this? He will be given his punishment by the FA (and quite rightly so) - probably a fine, plus a ban of a certain number of matches - and of course, the club can't be seen to condone this sort of behaviour. But to get rid of him entirely would be foolish, after he's done a very good job with the team he has this season. When a player gets pulled up for bad conduct, he has to accept whatever punishment the FA hands him. But he doesn't expect to be jettisoned by his club, as well. Indeed, in the majority of recent cases the club has stood by the player involved (as in the case of Luis Suárez biting Bransislav Ivanović at the end of last season, or West Ham Captain Kevin Nolan's two Red Cards [so far] this season). Pardew deserves a hefty fine, and he deserves a ban. Anything more is hyperbole. And to suggest that these cases should be judged circumstantially, rather than on their own merit (as Robbie Savage seems to) and therefore to accept - even encourage - inconsistency in FA judgements, is utterly ludicrous.